With two outs and two strikes in the bottom of the ninth, the Astros were one pitch away from clinching a 5-3 victory and splitting the series against the D-backs. Paul Goldschmidt had other plans. The rookie first baseman, who showcased immense raw power throughout his Minor League career, showed off that same power Thursday night as a pinch-hitter for pitcher Bryan Shaw. With Xaxier Nady on first, Goldschmidt battled to a 2-2 count against Astros reliever Mark Melancon. That’s when the slugging youngster crushed a game-tying, two-run homer off the upper deck façade in left field. The bomb was Goldschmidt’s second career homer and the first pinch-hit home run of his brief time in the Majors. He became the ninth rookie to hit a pinch-hit home run this season, as well as the 17th rookie in team history to smack a pinch-hit dinger. The pinch-hit hero was rewarded for his efforts by a curtain call from the Chase Field faithful. The ninth inning rally sent the series finale into extra innings. Closer J.J. Putz came on in the top of the 10th and recorded a 1-2-3 inning. The hot bats got started once again in the bottom of the inning. Ryan Roberts led off with an infield single, which was followed by a Justin Upton base hit. Chris Young then stepped up to the plate following a Miguel Montero fly out. Young provided the game-ending heroics with a three run walk-off homer to left. Houston elected to stick with left-hander Sergio Escalona despite the right-handed hitting Young coming to the plate. That decision proved costly in the end. The 8-5 win in the series finale gave the D-backs a series victory over the visiting Astros. Arizona also extended its lead over the Giants in the National League West to one game. It’s the 12th occasion in which the D-backs have sat in first place this season, while it’s the third time they have held the top spot in consecutive games. From Monday’s game one to Thursday night’s dramatic comeback, the four-game series was a compelling one. 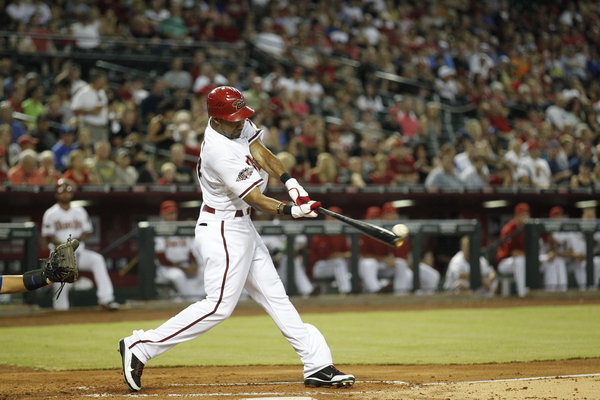 The D-backs completed two comeback victories after struggling early in the games. Arizona certainly grinded through some steep deficits. They trailed by six at one point in Tuesday’s win and were down by four runs early in Thursday’s thriller.